Indulge in everyone’s favourite wrapped food every day of the week. National Taco Day is October 4. Native Tongues Taqueria. Photograph by Jared Sych. Whether they’re filled with beef, chicken, pork or fish, there’s no denying that tacos are one of the best wrapped foods out there. Thankfully, Calgary restaurants know that, and offer great taco specials that you can hit up every day of the week. Los Chilitos Taco & Tequila House offers up authentic Mexican food, and the tacos are no exception. On Mondays during its all-day happy hour, stop by for a $5 margarita and $3 chicken, beef or pulled pork tacos. Shillelagh’s Pub in Signal Hill offers a taco deal on Monday nights. You can get three soft or hard beef tacos for $5 after 3 p.m. and wash it down with a $5, 14-ounce pint of Canadian or Coors. The Park Kitchen & Bar serves four different kinds of tacos on Mondays. There’s a $6 lobster taco, a $6 chicken taco, a $5 ahi tuna taco and a $5 pulled pork taco. The deal starts at 2 p.m. and there’s no minimum order. Wild Rose pints are only $6.25 as well. Starting at 3 p.m. on Mondays, Tipperary’s Pub offers up three soft or hard shell beef tacos for $4.75. Specials like all-you-can-eat wings for $12.25 and $4.75 pints of Canadian and Coors are also available. This subterranean pub on Stephen Avenue offers three beef tacos and a beer for only $12 on Tuesdays from 4 p.m. to 8 p.m. Located in Mission, Joyce on 4th Irish Pub has soft tacos for only $2.99 each starting at 4 p.m. on Tuesdays (minimum order of 3). You can also get margaritas for $6.25. Starting at 5 p.m. on Tuesdays, you can get tacos for $3.50 each at Julio’s Barrio in Kensington. The Mexican restaurant also offers $5 El Jimador tequila then. In addition to its Monday taco special, Los Chilitos also offers a second special on Tuesdays. This time around, individual tacos with chicken, pulled pork or beef are $2.50 each (you have to order at least three though). You can also get a bottle of Dos Equis for $6. If you’re looking to get your taco fix during the day or at lunch, Market offers $3 tacos from 11:30 a.m. to 6 p.m. on Tuesdays. There are three kinds to choose from: barbecue pulled pork, duck confit and tuna poke. The minimum order is at least two of one kind. The deal: Three tacos for $9. Head to any of National’s four Calgary locations any time on Tuesdays to try three fish tacos for $9. This taco-focused restaurant in the Beltline offers its tacos de guisados for only $2.50 each all day on Tuesdays. Grab a seat under the strings of lights hanging from the ceiling and order any combination of roast chicken, confit pork, refried beans, beef brisket, chorizo rojo or mushroom filled tacos. You can also order $2.50 tacos during the restaurant’s reverse happy hour, which starts at 10 p.m. every night. Starting at 4 p.m., both of Pig & Duke’s locations in Connaught and downtown serve two pulled pork tacos for $6 on Tuesdays. You can also get a glass of house wine for $6.50. 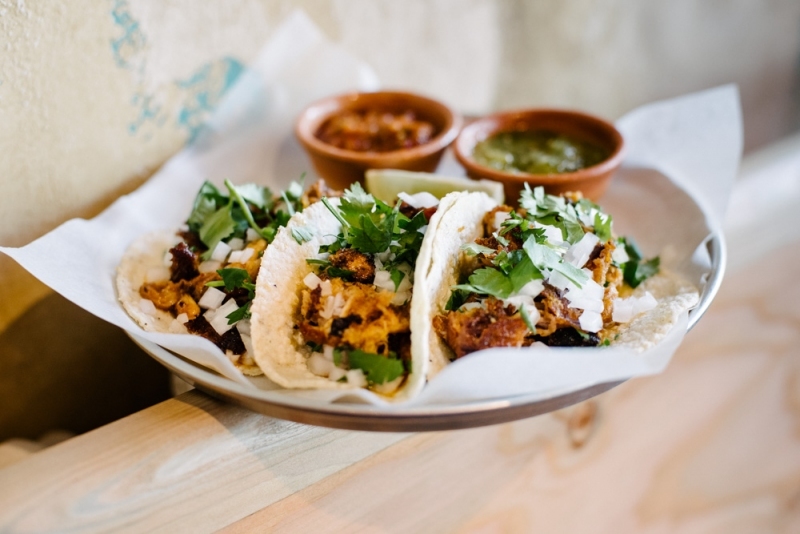 Most days of the week, Salt & Pepper’s taco dish comes with three tacos. But on Tuesdays, the restaurant has a self-serve taco bar where you can get unlimited tacos for $16.95. Choose from chicken, chorizo or vegetarian tacos. Head to this downtown Irish pub for $3.50 fish or chicken tacos after 4 p.m. There’s no minimum order, and you can pair your tacos with a $5 margarita. After closing doors on its original location, The Unicorn re-opened in the space formerly occupied by The Libertine and Below Deck, and now offers three floors of great pub fare. Head to the Sports Cantina, which is on the upper level, or the Calgary Classic on the main floor for two tacos for $5 on Tuesdays after 4 p.m.
Tubby Dog may be known for its inventive hot dogs, but it also makes a mean taco on Tuesdays. Starting at 6 p.m., Tubby tacos, which come in chicken, pork, bean and cheese, beef and lengua, are available for $2.75 each. Other deals include tostadas for $3.50 and fresh chips with pico de gallo or guacamole for $4. Every Wednesday starting at 4 p.m., Home & Away offers ling cod fish tacos for $3 each. There’s no limit to how many you can order and select bottles of wine are also half-price on Wednesdays. UniMarket carries groceries, baked goods and meat at its south location. Stop by the in-store restaurant on Wednesdays to get any of its nine taco varieties for $2.50 each. There are three beef, three pork, two chicken and one vegetarian option. Offering one of the cheapest taco deals in Calgary, Dickens Pubs is the place to be on Thirsty Thursdays. Beef tacos are your only option, but at $1 each, it’s a steal. Pints of Phillips Blue Buck are also $5.50. Midtown Kitchen & Bar in Kensington serves $2.50 tacos all day on Thursdays. It’s a minimum order of three tacos, and you can choose between fish and chicken. Half-price tequila is the perfect accompaniment to this great taco deal. Taco lovers will be very happy during Anejo’s daily happy hour, which is from 3 to 5 p.m. and 9 p.m. until close. During that time, the Mexican restaurant’s tacos are half price, and you can choose from beef, chorizo, pork, chicken, crispy tilapia and mushroom options. This popular Mexican restaurant on 17 Ave. S.W. is well worth a visit for tacos during Halfy Hour from 3 to 5 p.m. and 9 p.m. until close, seven days a week. During that time, all taco orders are half price. Good luck deciding between the slow roasted pork, pulled chicken, beef brisket, ground beef, mushroom and breaded tilapia filling options.